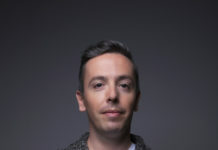 What’s Cooking is our latest feature, in which we aim to dazzle you with what’s cooking in a kitchen near you right now. Not restaurant critiques per se, but looser dish-by-dish updates of meals we’ve enjoyed and specific tastes that have tantalized us. Hopefully they’ll tantalize you too. 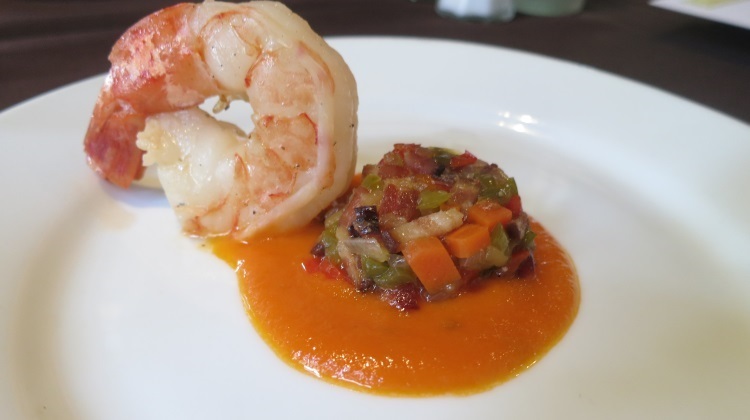 A Grilled Shrimp ($8) appetizer with an eggplant and bacon caponata plus a glut of tomato saffron broth. A fun appetizer dish with notes of the summer BBQ for sure. Be sure to check out the revised cocktail menu, all under $8, to wash it down. 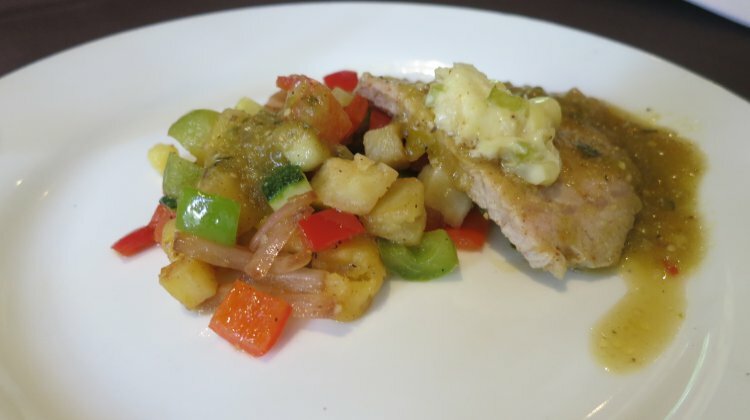 A Pork Chile Verde ($19) features a bone-in pork chop, yukon gold potatoes, bell peppers, red onion, zucchini and roasted corn salsa. The dish has one eye on the impending fall months and impeccably tender pork. Paprika Crusted Chicken ($18) was probably my pick of the new menu items. Balancing out the earthy paprika is the lush and creamy sweet corn risotto base. 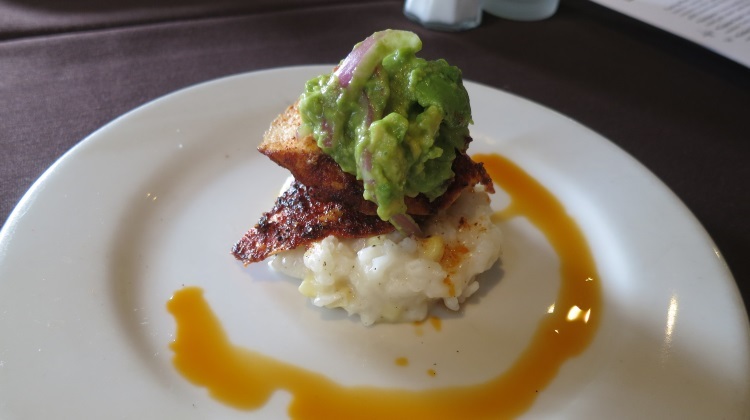 A dollop of avocado salad and swirl of chili oil complete the South Western minded rendition on a larger menu that takes in plenty of eclectic world cuisine. 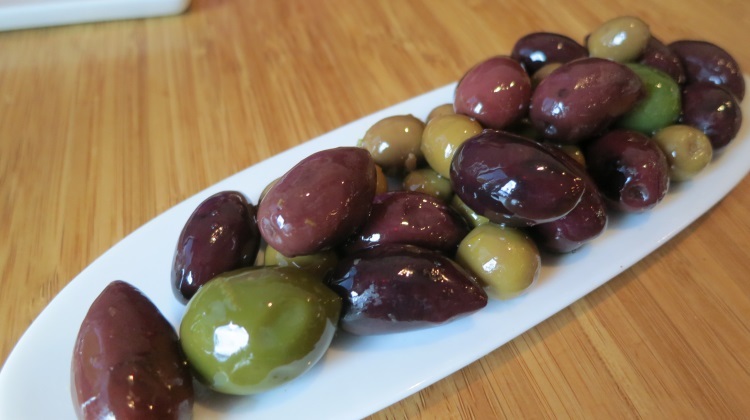 Does anything say tapas louder than bright, juicy Olives ($7) bursting with salinity. Marinated with fennel, citrus and bay leaves, Finca’s offering will leave you hurling obscenities at the canned stuff in the store. 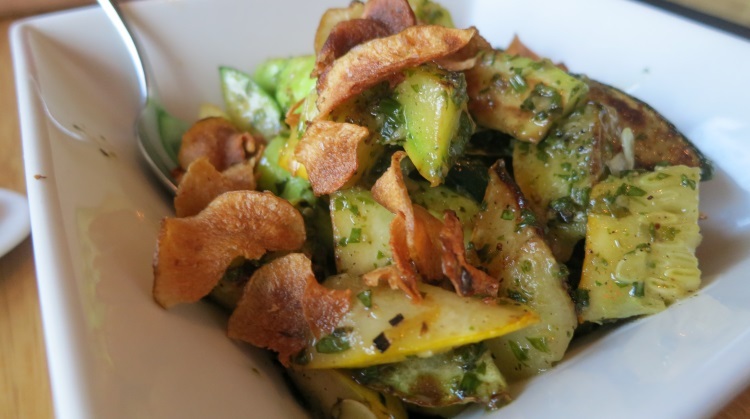 With the Summer harvest reaching its peak, expect to see plenty of items over the next few weeks like this stop you in your tracks – Summer Squash ($7) – simply seasoned and grilled. If your waiter begins the meal by saying “I have this special with fresh…”, cut him off right there and quickly reply, “two please”. 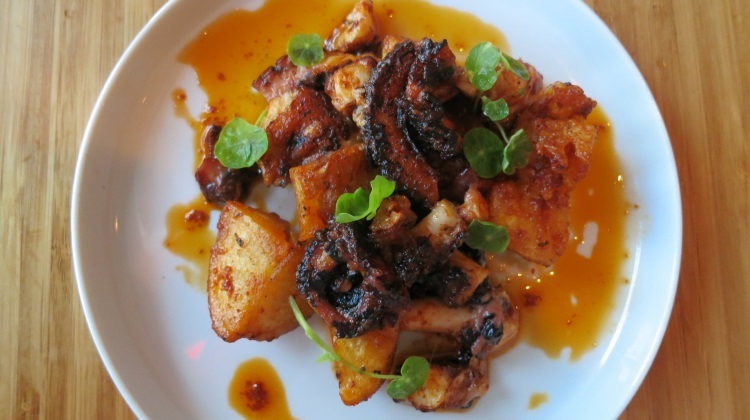 Finally, tender and smoky Octopus ($14) with paprika, deep fried spuds, olives and olive oil. Just one more example of great ingredients, simple handling and perfect execution. Be sure to stop by for a final summer hurrah before the restaurant closes up shop and heads to its new downtown digs. 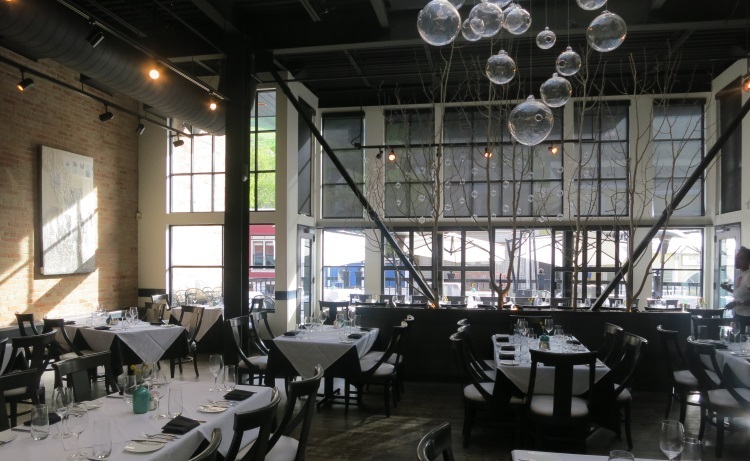 I recently took in my first dinner at Riverhorse On Main at the invite of the restaurant with several other food writers. Like the restaurant’s namesake, the cuisine here is muscular but still plenty elegant. 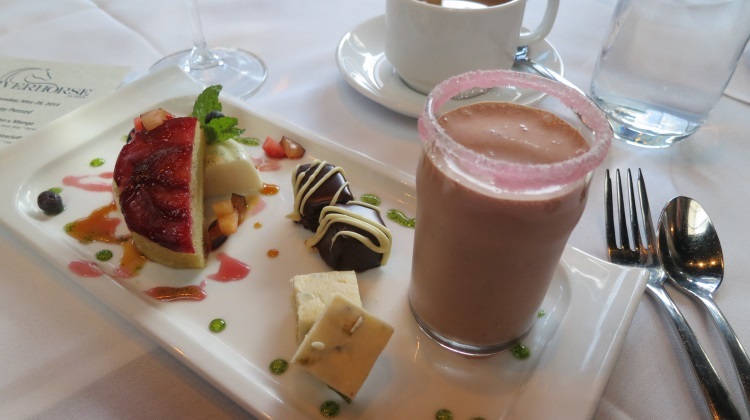 It’s mountain-minded while maintaining plenty of refinement, not to mention fun – check out the dessert plate at the end. 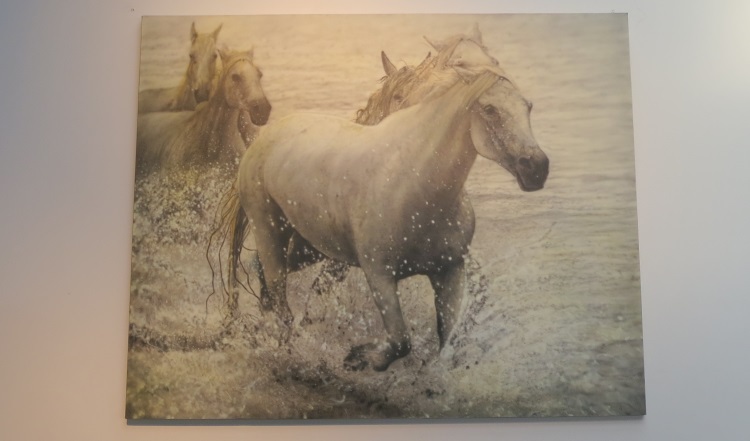 Riverhorse: A horse is a horse, of course, of course. A highlight of the evening was this dish, buffalo and trout served up surf and turf style. An amalgamation of two other items on the menu that can be ordered ala carte ordinarily. A few points here. 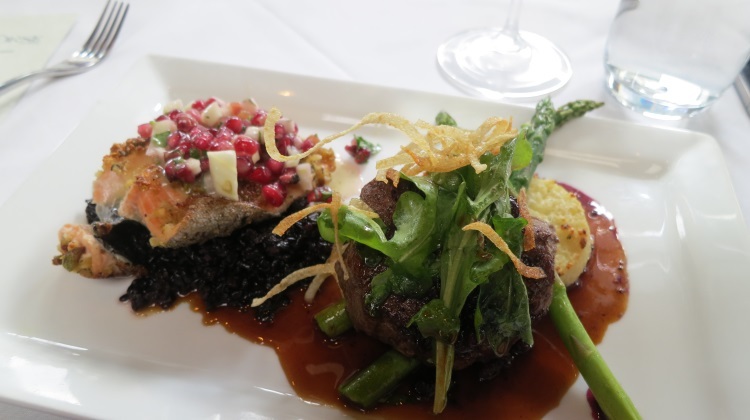 First consider the beef was cooked with the same pristine perfection as the fish was handled delicately. Next consider this served in one fell swoop for a table of maybe 15 or more writers – and we’re a bunch of jaded complainers and ne’er-do-wells at best. That’s no mean feat. Suffices to say, order beef and fish with confidence here. Lastly, that dessert sampler I mentioned. Does this really need any words? Ok, if you insist. It’s gleeful, it’s giddy, it’s executed fabulouslry. Check these guys out next time you’re on Main Steet. Disclosure: Dishes at both Oasis Cafe and Riverhorse On Main were sampled during press dinners. Finca was paid out of pocket.